I'm switching gears a bit today to talk about something new- career fairs! It's that time of year at most universities, and I am lucky enough to get to do some recruiting for my company this fall. I have a few trips coming up, so I thought it might be helpful to give some tips to all the students out there. After being on both sides of the company table, I can definitely tell you that I've seen it all, and I hope that my tips will be helpful! There are so many companies that come to career fairs, and it can definitely be intimidating. Usually, a list is provided ahead of time (or you can ask what companies will be attending) to help narrow down which companies you really want to work for and are interested in. Do some research on those companies so you have an idea of the industry and what positions you might be interested in. Even though I work at a large corporation that has a huge presence on campus, I got asked a few times "So, what does your company do?" REALLY people!? Of course, if you have 20 companies that you're interested in, you won't remember everything. I suggest bringing a notebook (preferably a nice pad in a case, not just a spiral notebook) and writing down a few facts about each place. Review your notes while you're waiting to talk, and then dazzle the recruiters with your knowledge! I noticed that a lot of companies (mine included) are trying to go "green" and don't take paper resumes. However, deadlines to submit applications and resumes are usually the same day or the day after career fairs, so make sure your resume is ready to be submitted immediately. Another tip for resumes is to format it in PDF to make sure the recruiter sees the same resume that you see. Some companies may have different versions of Word or run different applications, so changing the format to PDF ensures that your version looks the same as their version. Also, PLEASE proofread, and have your parents and your friends double proofread!!! It's really awkward for both the applicant and recruiter when you stop at a booth with nothing prepared to say. I hated having to ask them basic questions (name, major, year..). A few people came up with a perfectly prepared speech, and that really impressed me and made it easier on me to ask follow up questions. The speech doesn't have to be formal or anything specific- just give me some basic facts. Here's a good example to get you started! "Good morning! My name is Gretchen, and I'm a senior in Information Sciences and Technology. I'm looking for a full time position at Gretch Runs. I'm interested in graphic design and web development, and have previous experiences at ESPN as an intern. I worked on a project to redesign the tennis portal of their website. I would love to hear more about opportunities at Gretch Runs for a full time position". I can tell you this from experience now- my energy level is really high in the morning, and steadily goes down throughout the day. There are so many students to talk to, and most are asking the same questions. The students who came earlier definitely got more energy and information from me, and also got to take home more swag from the companies! As I mentioned above, I got asked the same questions over and over. I appreciated the fact that students came with something to ask, but everyone asked me "How did you get to where you are in the company?". When a different question was asked, that student really stuck out in my mind and I appreciated the effort and thought that went into their preparation. When doing research, try to pick out a few facts about the companies (How are they involved in the community? What are some recent awards they won? What is a big project they're working on?) Asking specific questions that gets the recruiter thinking is always a good thing! It's really nerve-wrecking to think that this is your one and only opportunity to make a good impression to the company. I know exactly how nervous the students are, and how intimidating the career fair is! If you have one bad session, forget about it and move on to the next company. Chances are the recruiter won't think it went that badly, and will forget about it by the time they see the next five students. Move on and do better at the next booth! Another good thing to remember is that this isn't your interview. In fact, I don't conduct interviews at all, so you could completely fall flat on your face in front of me and it wouldn't make a bit of a difference! As mentioned above, bringing a notebook can be really handy when trying to remember facts about a bunch of different companies you're interested in. It's also helpful to write down specific dates and events that recruiters will throw out. It's impossible to remember deadlines for every company, so having everything written down to refer back to is a life-saver. I also don't have business cards to hand out, so I appreciated when students took the time to get my information. There you have it! 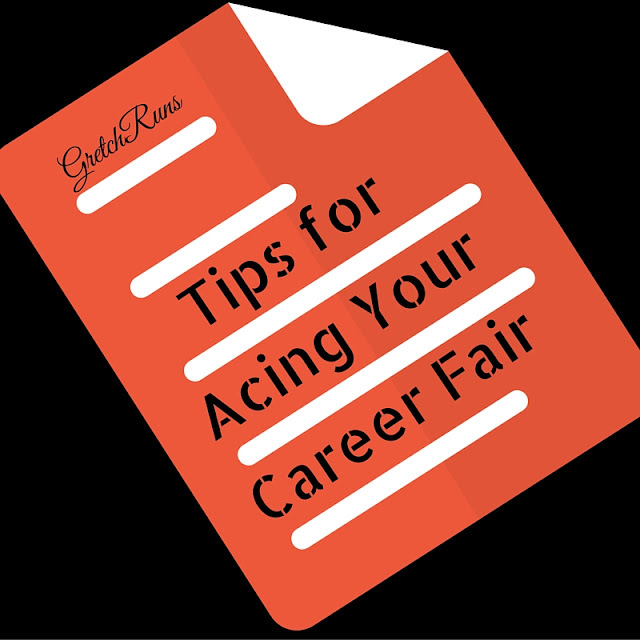 A few tips on acing your career fair. Overall- be prepared and act interested. Those two things will get you very far! College students- how is the job search going? Need any advice? Full time employees- what advice would you give to students looking for jobs or internships? I have a feeling Buddy would do all the talking on that elevator ride. I never went to a career fair when I was in school but I can imagine it to be quite intimidating. I would want to simultaneously high-five and smack the child who informed you that they were hungover. Congrats for making it, but you're a big dummy to tell me about it! Haha. You're lucky you never had to go to one! And I feel the same about the hungover kid...been there, done that, but didn't tell someone I'm trying to get a job about it! HA ha ha! I love all the pictures you put up. Some of them really wear Hawaiian shirts? And tell you that they're hungover?! Sheeeeeesh. I need to watch the Notebook again. One of my faves. People actually say that you're old? Really? Common sense goes out the door for some. :) Your job sounds fun!